You know when you have a great feeling about something you've made and you absolutely do not care whether anyone else gets it or not? That's how I feel about this calendar. It was one of those projects that just came out without much fighting with myself. 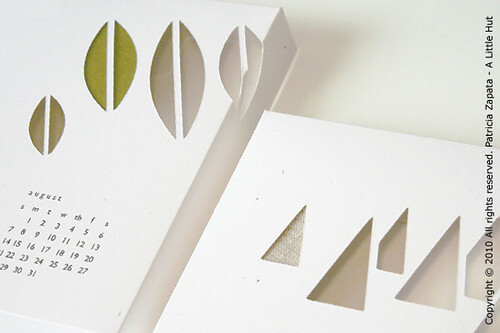 This calendar will be offered as a DIY option—as a PDF document or printable/SVG files. I realize that this may not be what everyone would prefer but there are two reasons why I decided to do this. The first, is that (being perfectly honest with myself—and you) the production of any amount of calendars seems daunting to me at the moment. The second reason is that there are so, so many great ready-made options that I wanted to design something that you could really tackle and make your own. In order to keep the project as simple as a possible, while still remain interesting to look at, I kept the shapes simple/approachable and set the design up with two months per page. This will make a fun (& economical!) project to work on for gift giving. Work on it on your own or as a group at a crafty get together. Throw in some yummy snacks and drinks and you'll have a great time! If you prefer more color in your calendar, all you need to do is use scraps of paper or fabric to the back of each calendar box. Here I used green paper and a piece of linen—but who's to say you can't make your version more sparkly and add glitter or shiny paper too? Remember that even if you don't add anything the color of your wall will show through each box. If you are interested in a ready made (printed and cut) version (with some small assembly required) please email me [info at a little hut dot com]. I may decide to sell a limited edition depending on the interest level. - To order a PDF printable version click here. 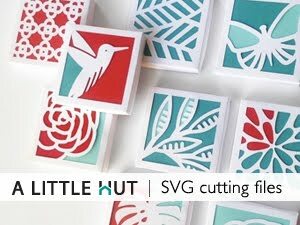 - To order SVG files compatible with SCAL (Sure Cuts A Lot) click here. EDIT - By request of several customers I am now going to be offering a limited edition of a ready-made calendar. It will be delivered completely cut, scored and there will be minimal assembly required. Order here. If you prefer a simpler calendar to work on, my blank DIY calendar is still in my shop (I had a few customers requesting the 2011 version in the summer—to get a head start on holiday gifts!) 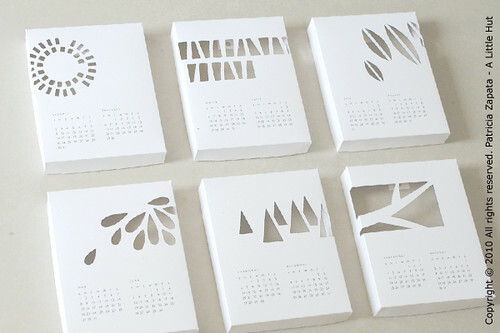 and my initial cutout calendar is still very popular too. From where I stand, calendars are a lot of fun to design. My biggest hope is that those of you that do choose to work on your own diy calendar find it just as rewarding as I do. So, here's to some fun paper crafting!